My name is CHAI SOOK LENG from Malaysia. More than a year ago, I had no obvious symptoms of nasopharyngeal cancer except for stuffy nose which I did not care much about. Later, I found a little slump on my neck, and went to hospital for physical check. After the check, the local doctor confirmed that I had nasopharyngeal cancer with metastasis of lymph. On hearing this unexpected news, I could not totally accept. My world immediately became dark, and I did not know how my life would be from then on. At that time, the doctor suggested me get chemotherapy, and I agreed with that. Then I had six sessions of chemotherapy. During the treatment, it was so suffering that I could not eat and sleep. What’s more, I kept vomiting for 31 days. As you could see, the side effect was great and the therapeutic effect was not so good. The pain of chemotherapy made me have a thought of giving up. Every time I wanted to give up, my little grandson showed up to support me. I have five children and two grandsons. One of my grandsons was four years old, and the other was one year old. Among them, my one-year-old little grandson was the closest to me. He was unwilling to go back home to sleep if he did not see me. Therefore it was so difficult for him without me. It was him that encouraged me and supported me. And he became a driving force for me to fight against cancer. The effect of chemotherapy was not so ideal, and the tumor on my neck became bigger and bigger. I could not tolerate chemotherapy any more. Thus, I began to find other more suitable therapies everywhere. 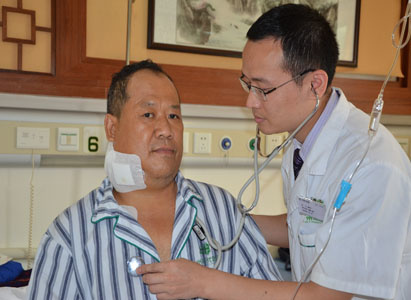 By chance I saw the report of Modern Cancer Hospital Guangzhou from Sin Chew Daily and China Press which gave a good introduction of the minimally invasive therapy and the medical team in the hospital. And then I got to know more about the hospital and found that I still had a hope. I must go to Guangzhou for treatment. I had spent all of my savings on chemotherapy, but for my little grandson and my family, I could not give up. Hence, bit by bit, I borrowed money from my relatives, friends and colleagues to take cancer treatment in China. On June 30, 2015, accompanied by my wife, I came to Modern Cancer Hospital Guangzhou. The MDT (multidisciplinary team) made a treatment plan according to my illness and physical condition. They said that cryotherapy was the most suitable for me. I trusted them and was willing to accept that. At present, I got cryotherapy once and felt good. I still remembered that I was not afraid entering the operating room, where the procedure roughly lasted for about one hour, but seemed like just a little while pasted after the anesthesia. After that, I felt slightly pain which was gone after three days. Besides, there were no other discomforts. The chemotherapy that I got before reached to the whole body by vein. 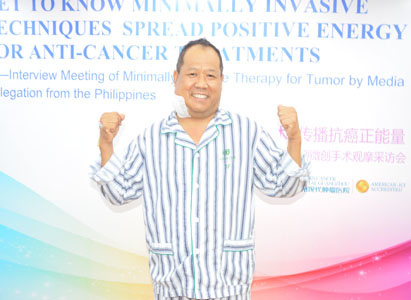 But this minimally invasive cryotherapy aimed at the tumor, which I thought would have a better therapeutic effect. Now, I had good appetite and sleep, and I could immediately eat and walk after the therapy. I felt much better. Compared with the hospital in Malaysia, Modern Cancer Hospital was more advanced and more modern. The doctors and nurses there were so nice, considerate and warmhearted. I felt warm and cozy here. What’s more, they arranged trips regularly for us to sightsee around Guangzhou together and to learn about the local customs. It was our first time to be in Guangzhou, so we were so happy that the hospital held these activities and we were willing to participate in. 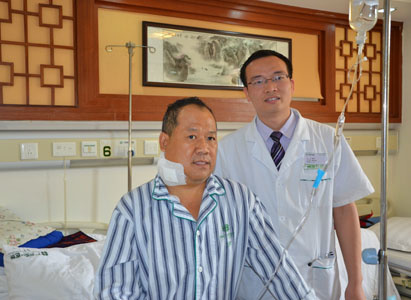 I believed that Modern Cancer Hospital Guangzhou was a suitable hospital for me to get treatment. And I believed that Modern Cancer Hospital Guangzhou was my last hope.